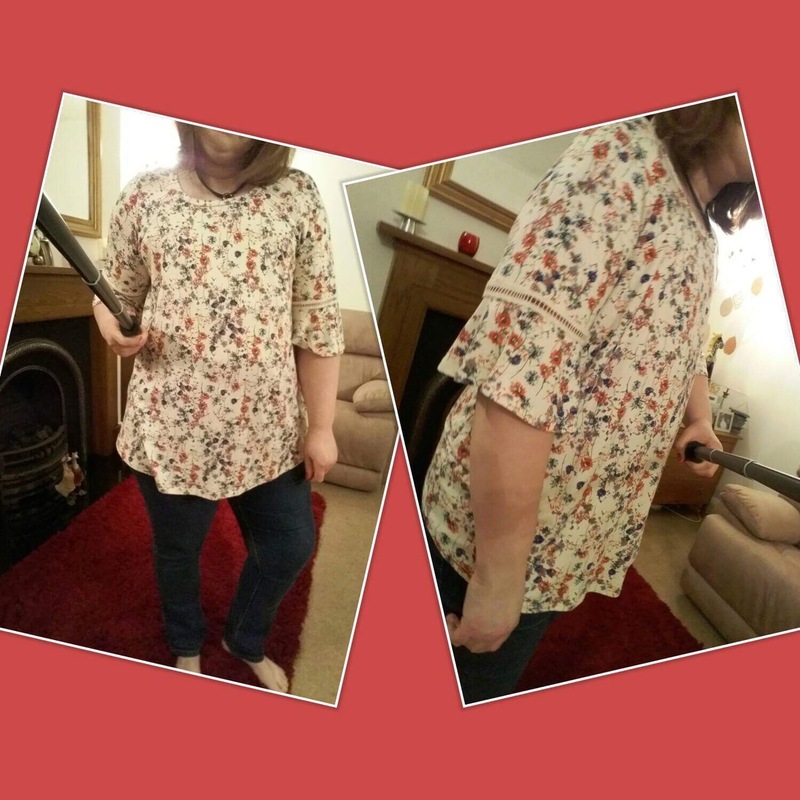 Welcome to the second Flat Friends Flatter Fashion Blog! 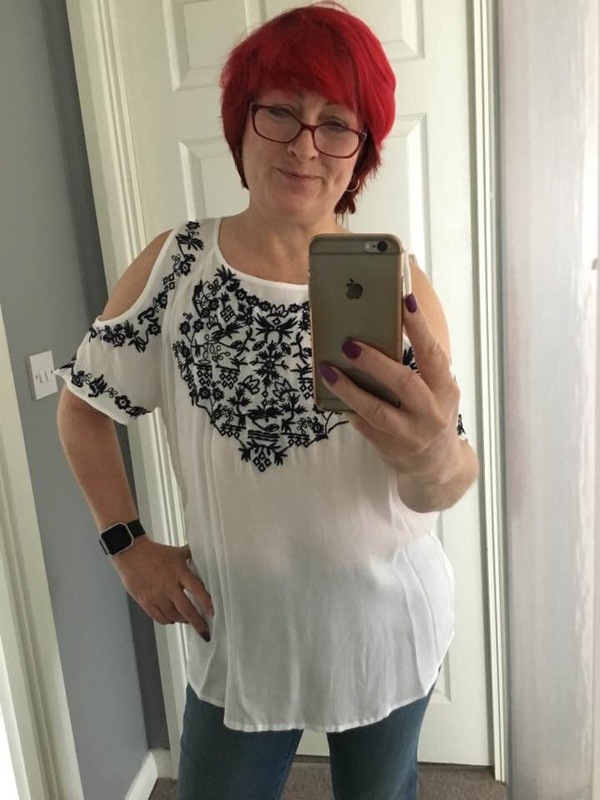 As you know, I am an incredibly proud member of Flat Friends UK, and now some of my Flat Friends are contributing to Flatter Fashion each season. 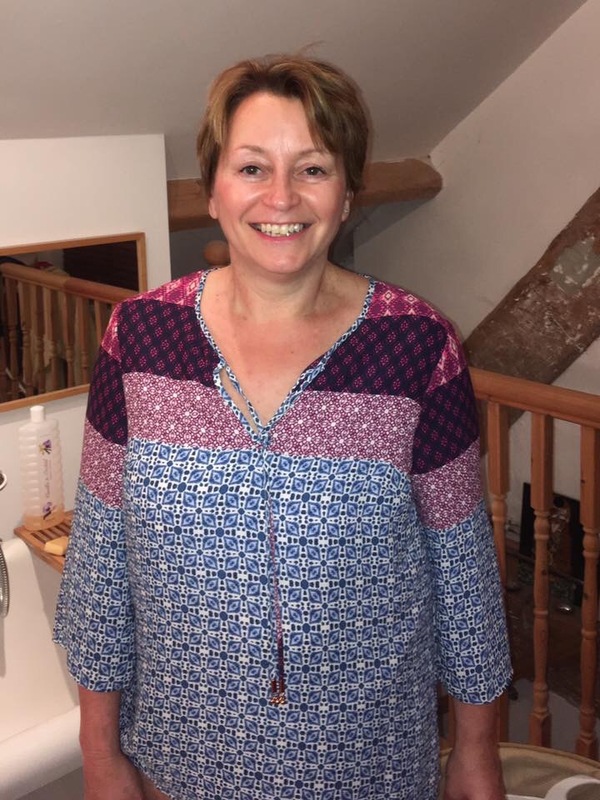 There are now well over 600 members of the closed Flat Friends UK group, which means there’s an enormous amount of knowledge and experience of finding clothes when you have had a single or double mastectomy. 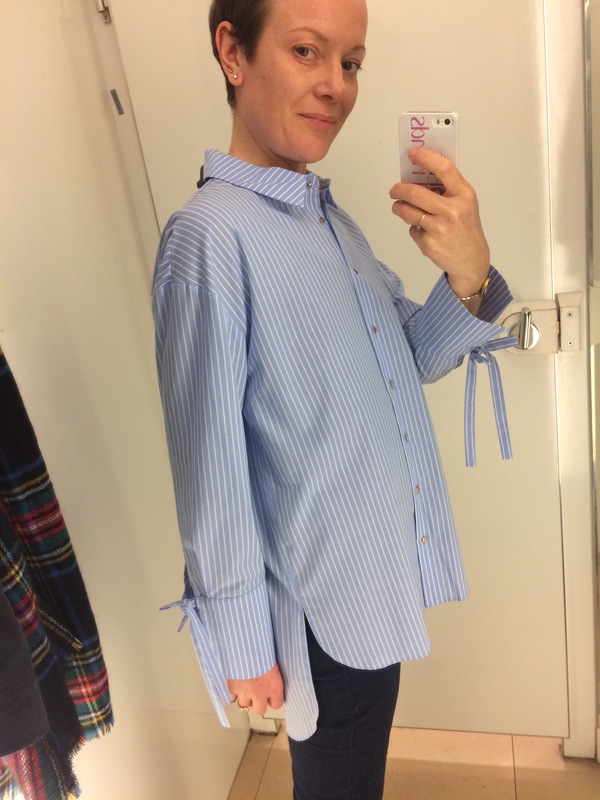 This first blog post will run from March 2017 til June 2017, and we will add to it with our shopping tips throughout the spring, as well as sharing general tips and style advice. 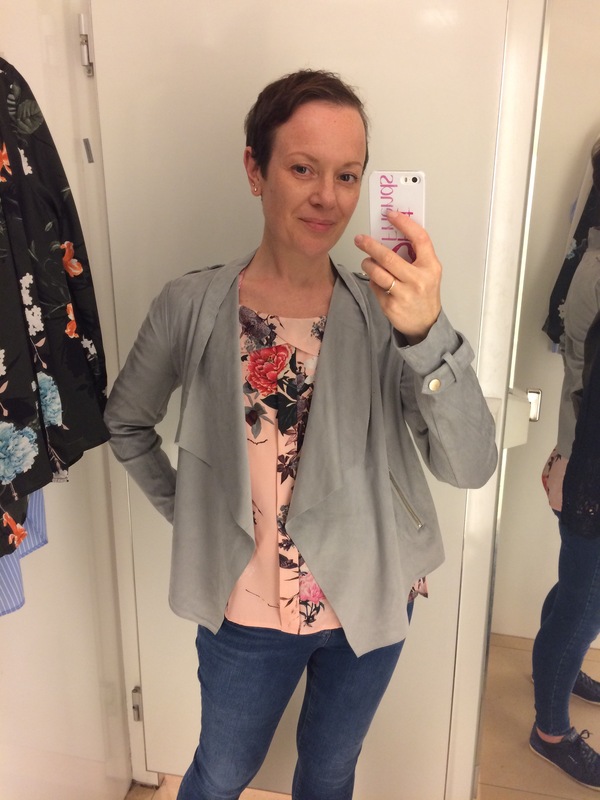 As I post this it isn’t quite March, but it is getting a little warmer and florals are everywhere in the shops so it seems time to launch the Spring blog! 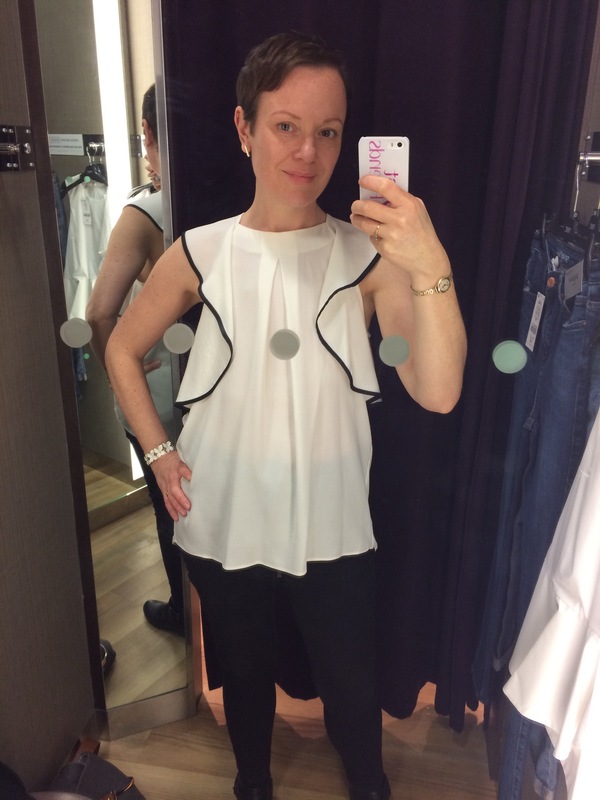 I’m kicking it off with some lovely pieces from River Island. 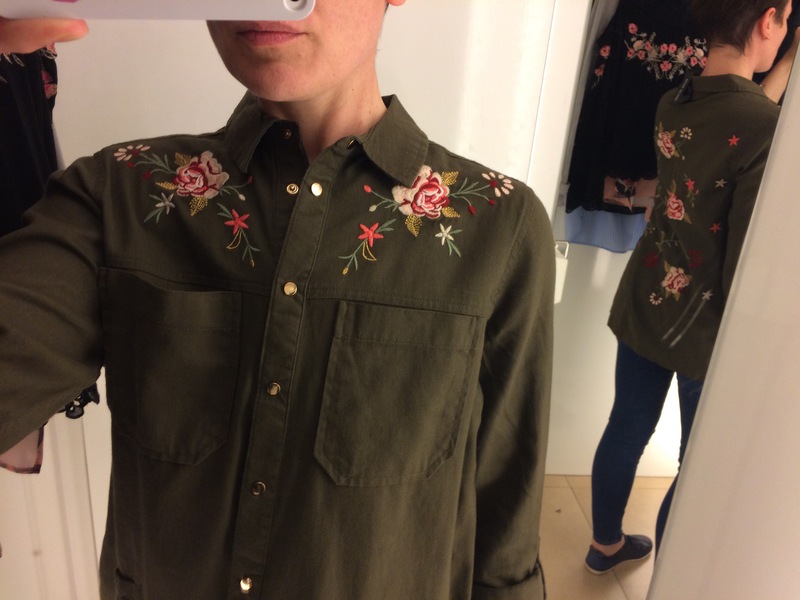 This shirt combines two key trends this season: khaki utility, and embroidered florals. 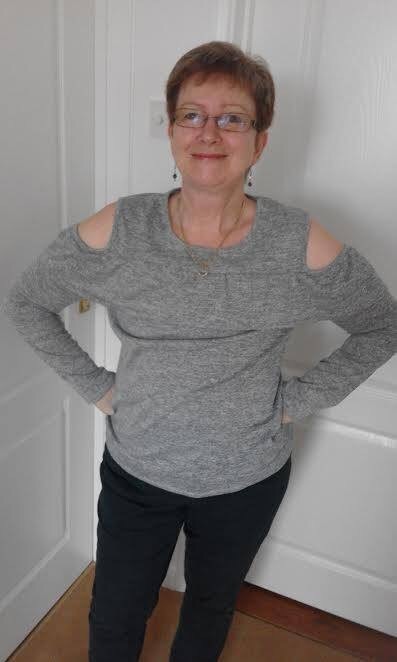 This shirt is great for single and double flat chests because it also has double breast pockets and no darts (it also has a really pretty design on the back which you can see in the reflection). 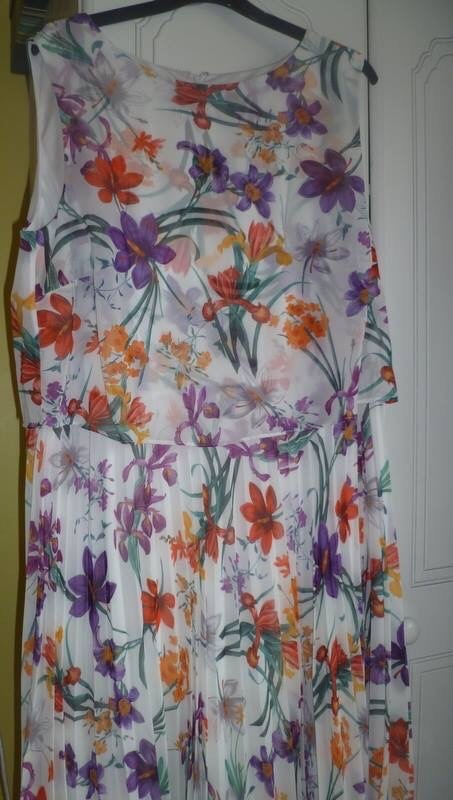 This next shirt would be great officewear, but also looks great with jeans. Again, this does not have darts so hangs really cleanly on a flat chest. There were a few different colours in this style. 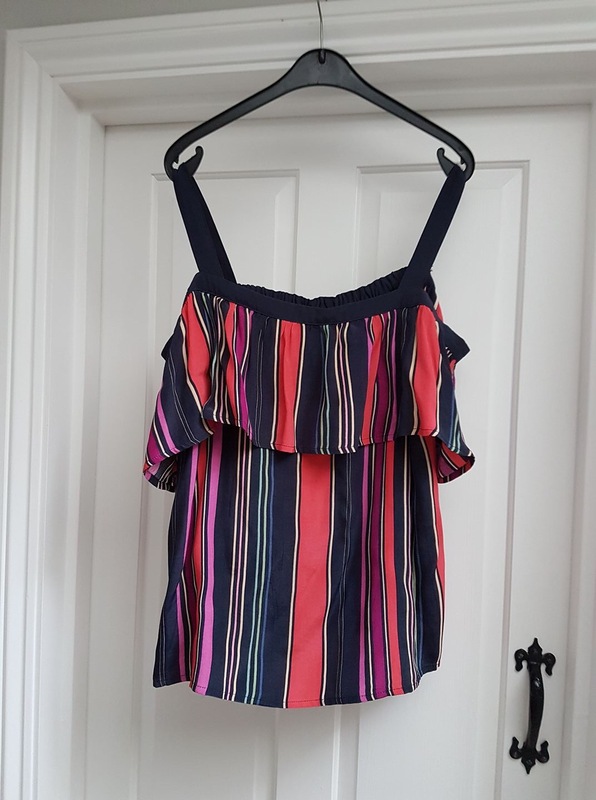 Another top perfect for a special occasion is this Bardot-style top. This sits now ce and high up on the chest so it doesn’t gape when you lean over. The bold pattern, layered collar, and central pleat should work well on single and double flat chests. 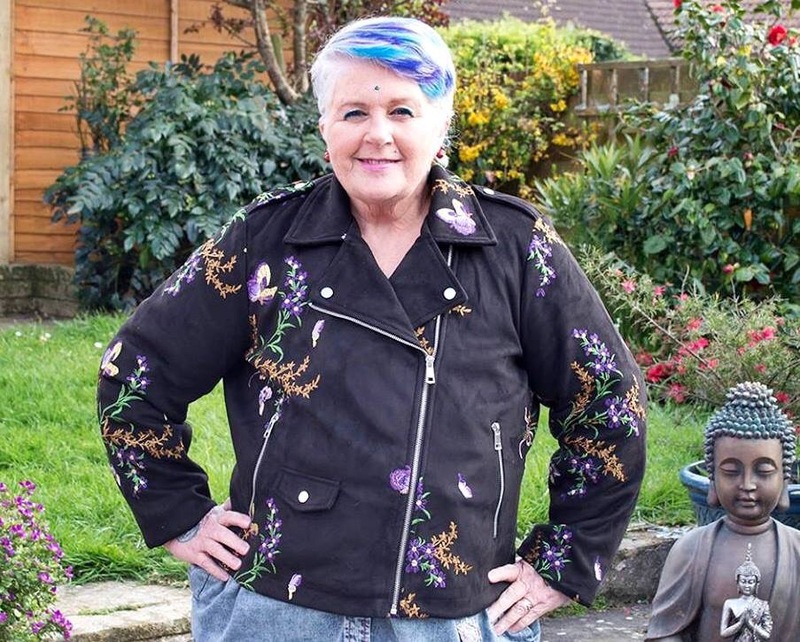 And here it is under the perfect waterfall jacket. 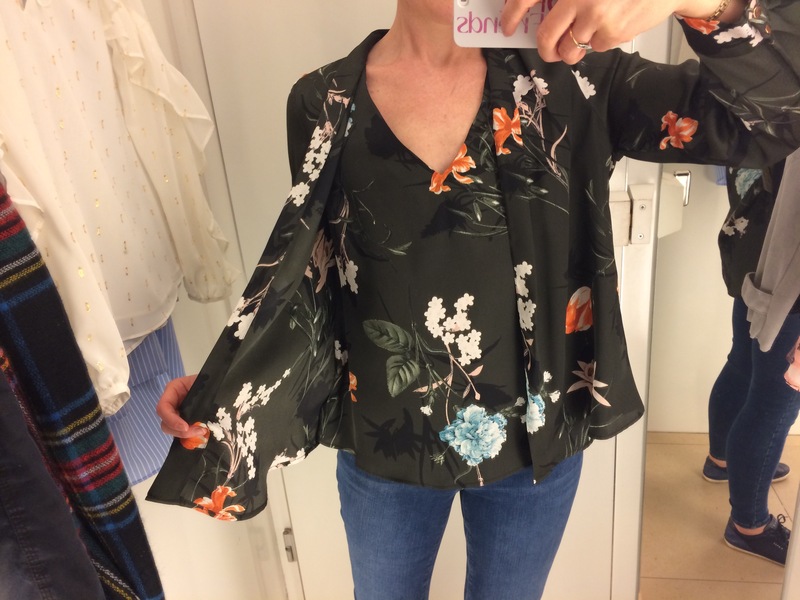 This khaki floral top is in a similar bold fabric, and has integral waterfall layers which drape like a cardigan over the chest. 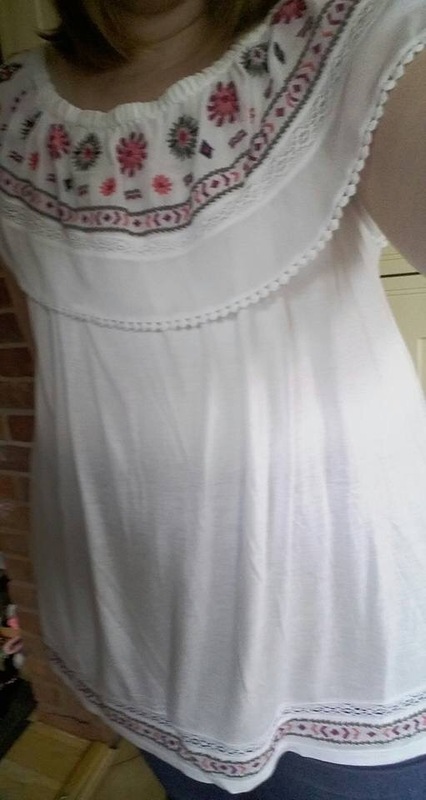 The only downside is the v-neck is a little low so you may want to wear this with a vest underneath. 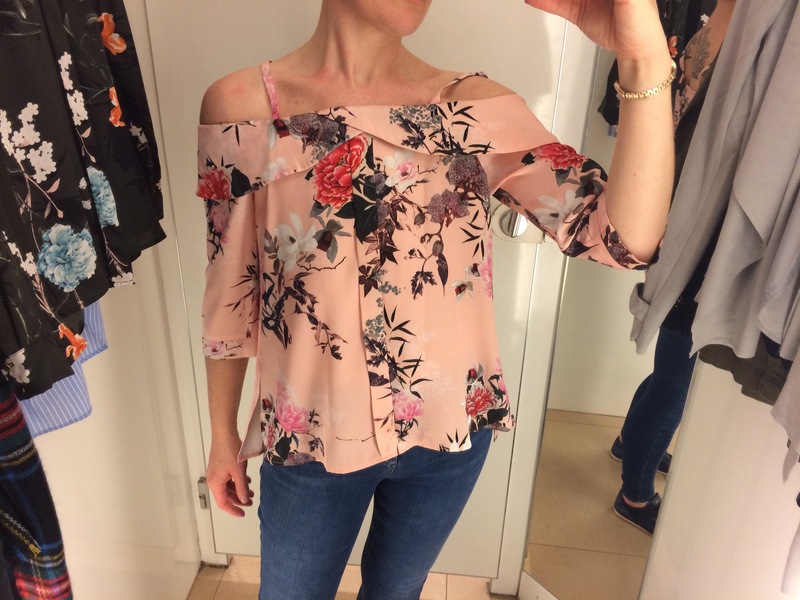 And lastly, a cold shoulder top…which I think are really flattering for us as they show a little flesh, proving you don’t need to flash a cleavage! 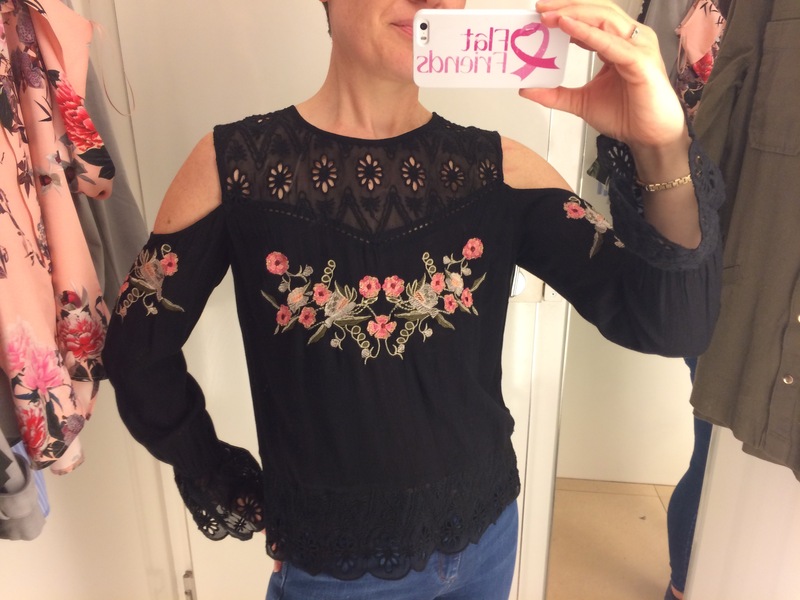 This one also picks up on the embroidery trend, and the decoration is perfectly placed over the chest area. It also has Broderie Anglais detailing above the chest creating the illusion of a sweetheart neckline. 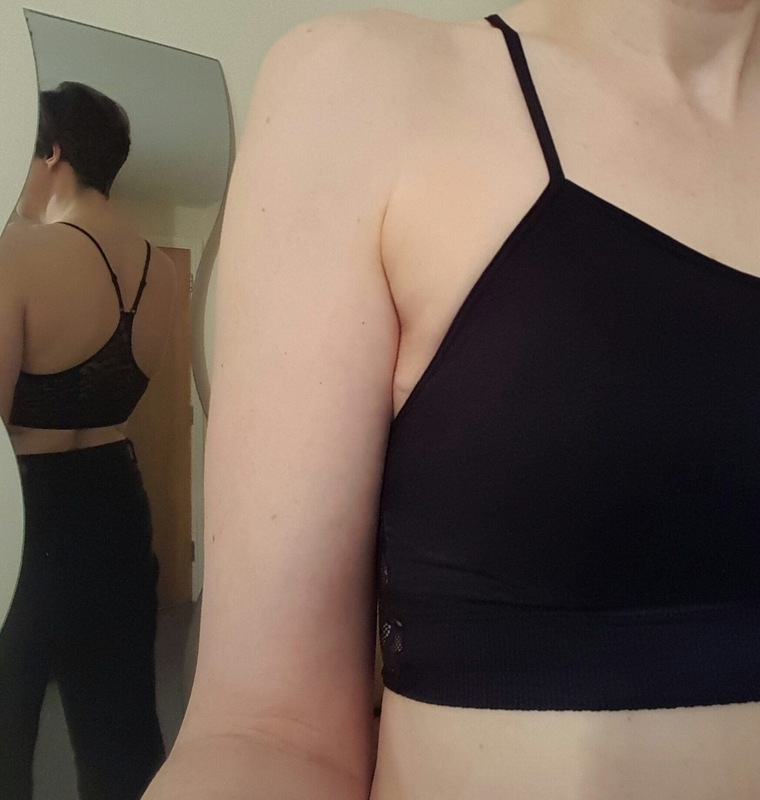 I wonder if the sleeves are wide enough to fit if you had lymphoedema, but if not I think this style is something to look out for if you wear compression sleeves and want them to blend in with your outfit. The following two tops are both from Next. 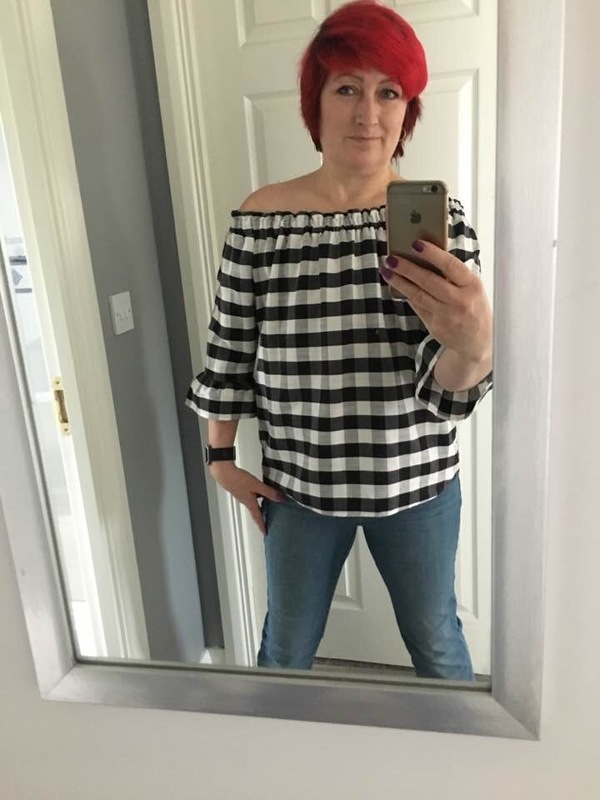 This floaty top works well because it has contrast frills which fall over the chest, as well as pleats at the neckline which create lots of movement and mean this top skins flatteringly over the tummy area. 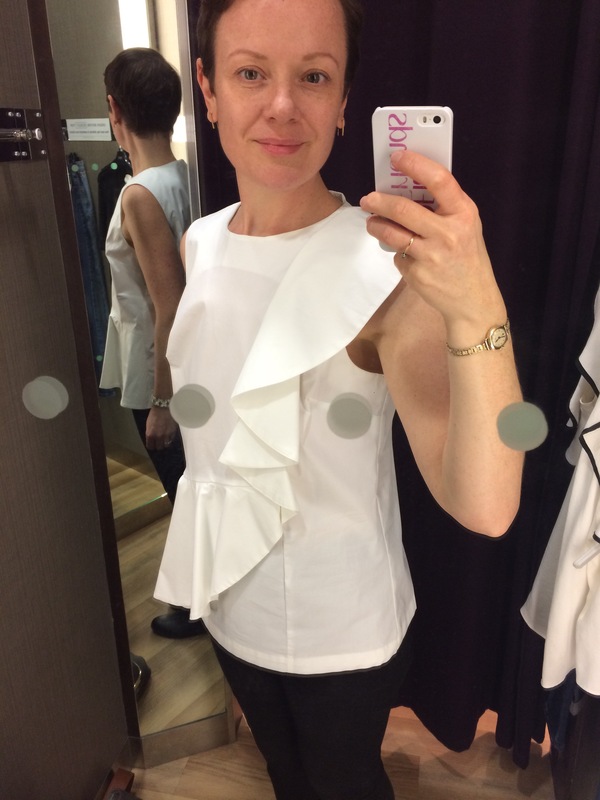 this next one would suit a single-flat chest, as there is a dart on the Left side and a frill on the Right to add depth to a flat side. It is made from crisp cotton so is smart enough for the office, or perfect for a hot day! I have included a couple of shots so you can see it from different angles. 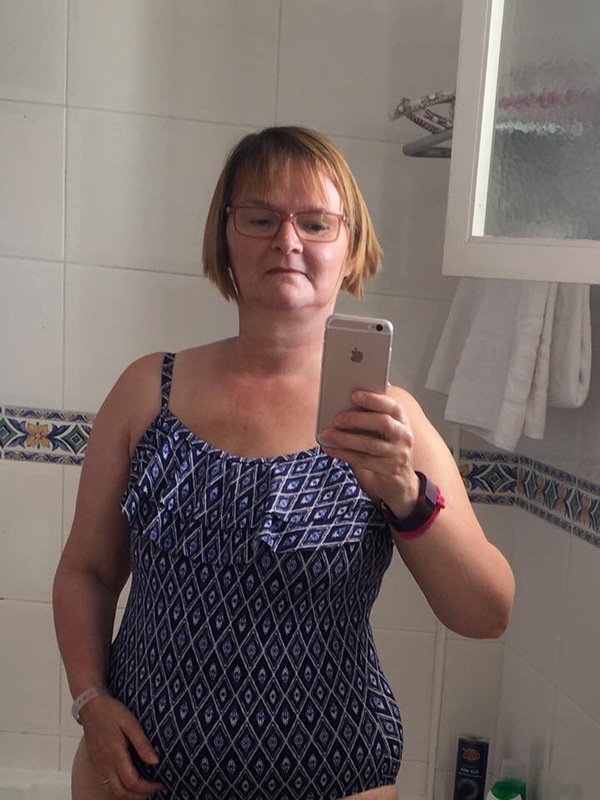 Flat Friend Carol has bought two tankinis from M&Co. 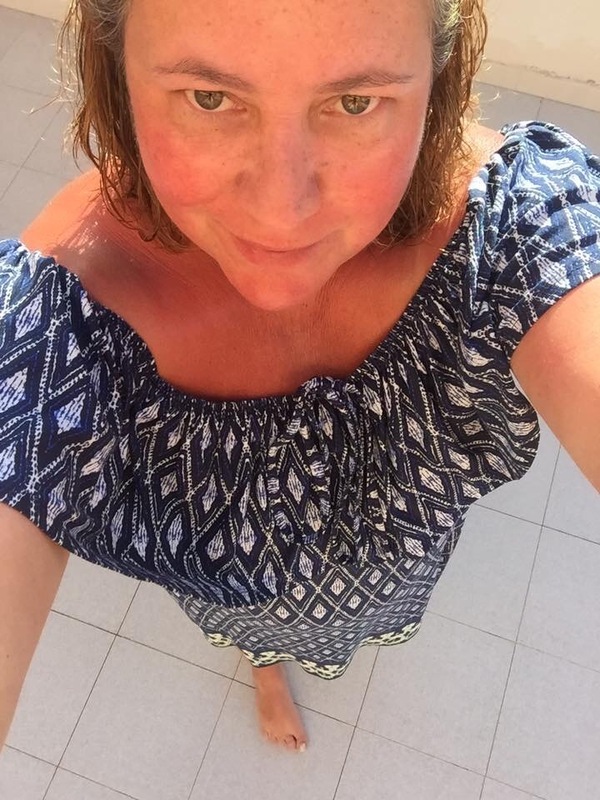 Carol says, “M&Co blouson tankini’s tick every box for me this year! Now I’m flat. Don’t want to wear a prosthesis but removable pads mean you could pop in one if you wanted. Loving the bottoms high waisted with tummy control!!! Well happy😎”. 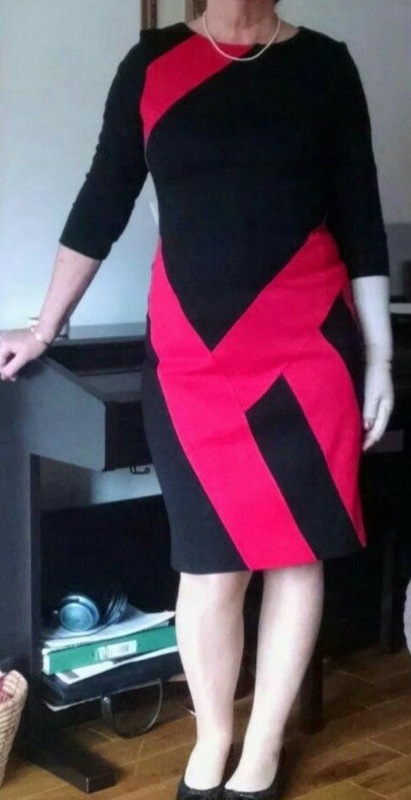 *Top Tip* Don’t be put off if you see something has darts, like Janet’s dress. Because of the light, floaty material the darts shouldn’t affect how the bodice hangs on a flat chest/side. 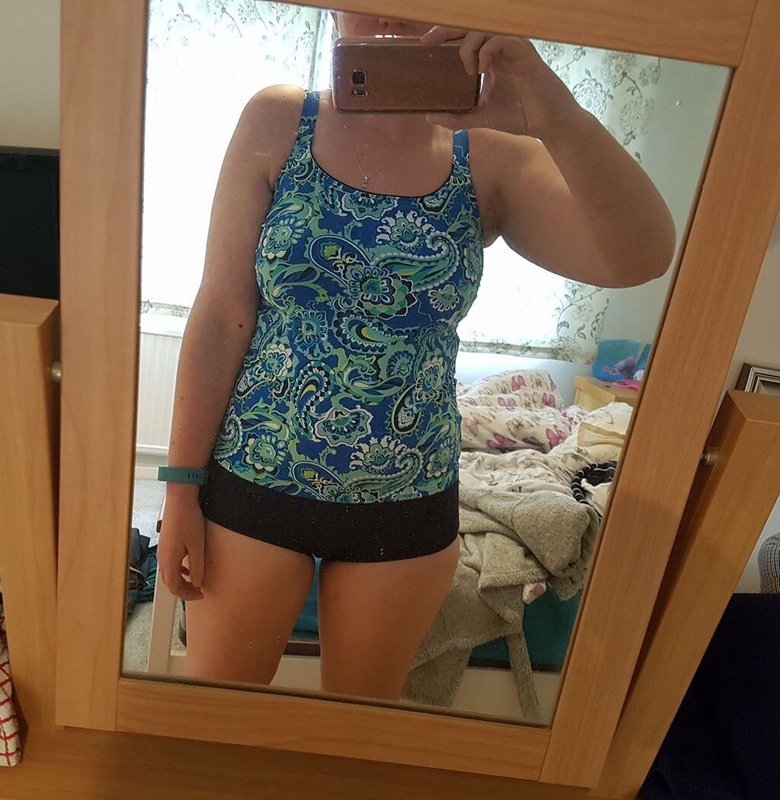 Floaty fabrics are also great for skimming over hips and the tummy area. 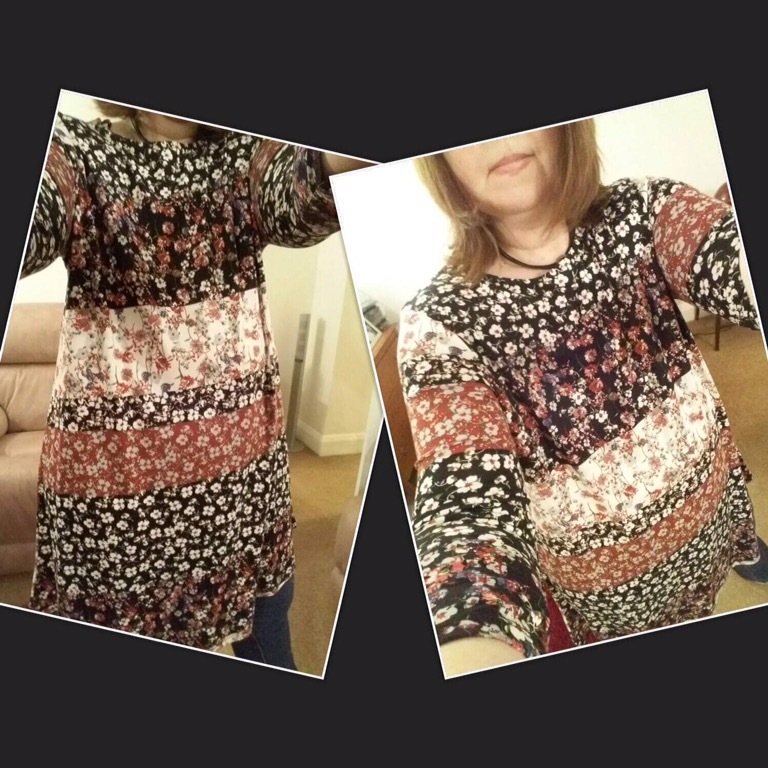 Flat Friends UK Trustee Sue bought these two tops from Tesco for £16 each. They are both on trend with a gingham Bardot, and an embroidered cold-shoulder. Both set off beautifully by Sue’s gorgeous hair! This is such a clever use of pattern! 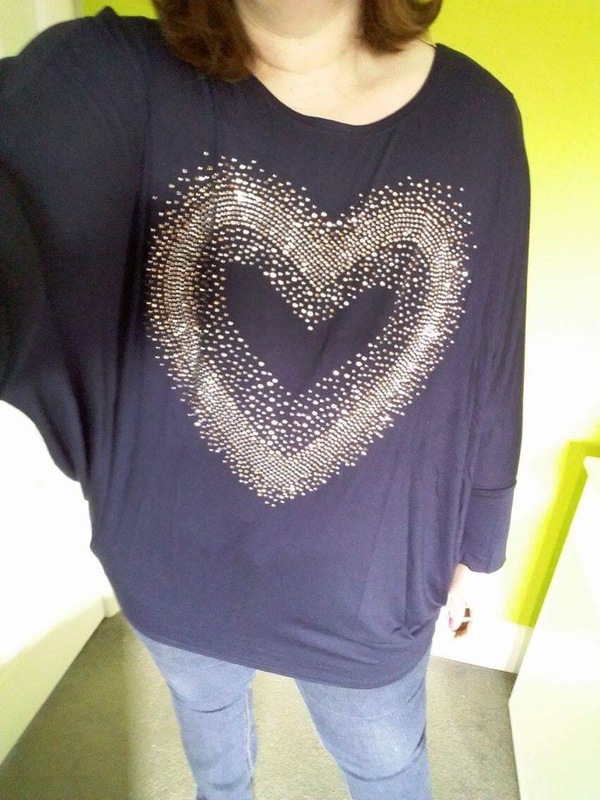 **NEWSFLASH** Kim went back to Next the following day and bought this top after so many of her Flat Friends telling her how much it suited her! 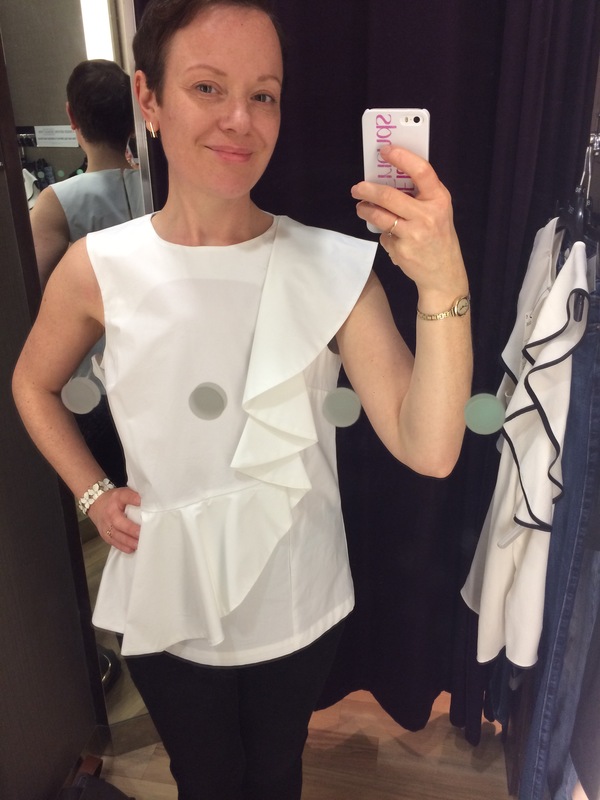 My top tip, if you feel the frills and ruffles this season are too ‘girly’ for you, is to choose a bold colour or pattern. Such as Kim’s red top, or Sue’s large gingham print above. I love the eye-catching decoration (and Loo Loo’s hair, which always looks this beautiful!). 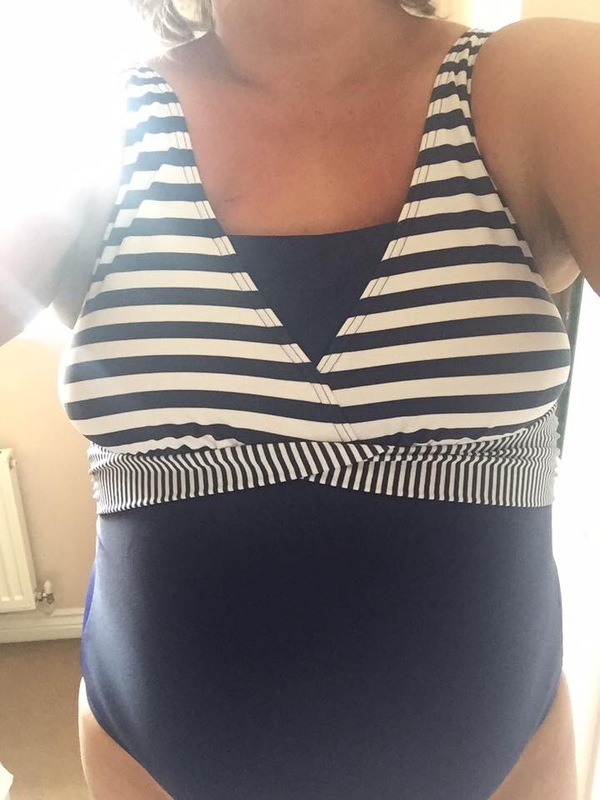 And here’s Tarn in a swimsuit which is also from Asda … and looks like it’s in the same pattern as Rachel’s dress. Tarn says, “I’m a uniboober and think it works”. Lots of Flat Friends agreed that the frilled costume is perfect for single-flat and double-flat chests! One Flat Friend who has the same costume thinks it would also be suitable to sew pockets in for foamies/Aqua Knockers. 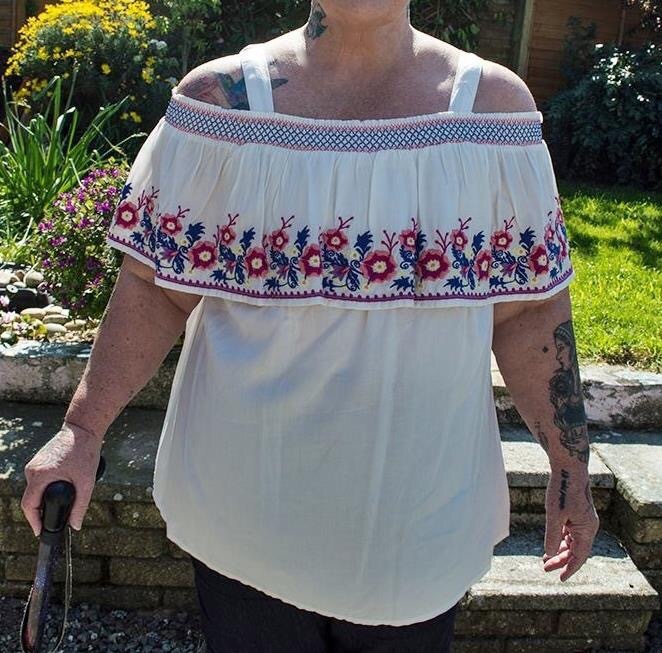 Still in Asda, Mary got this top in the sale (as well as Rachel’s strapless dress above). 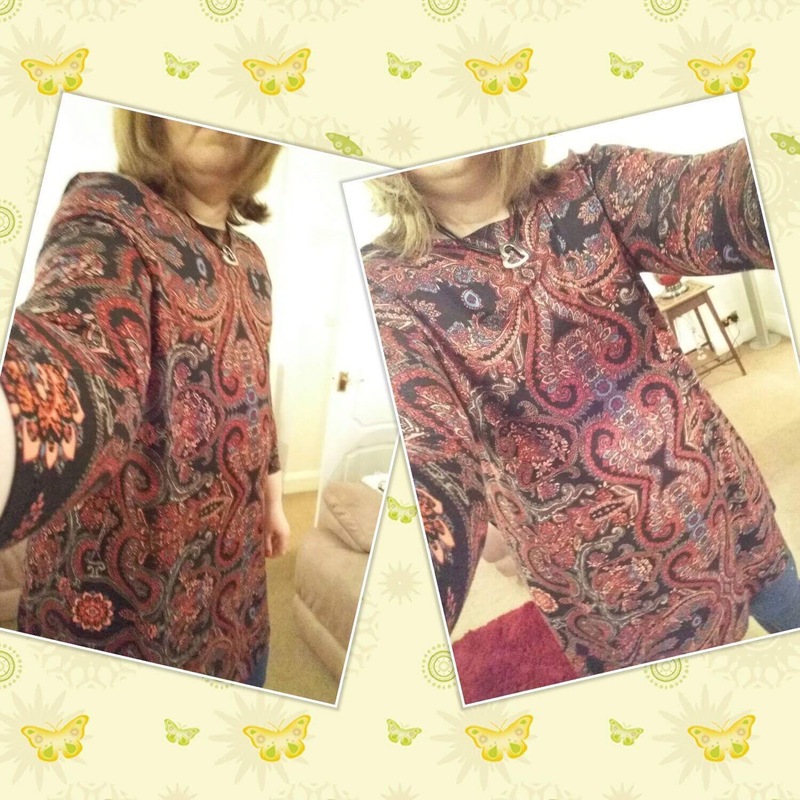 The contrasting patterns on this top are great for creating the illusion of depth. 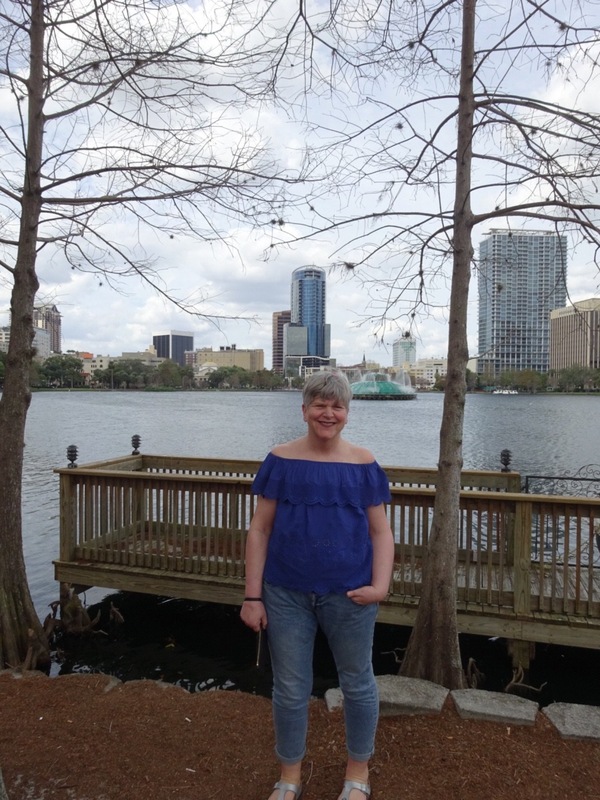 And believe it or not, Mary is a Uniboober (single-flat) and is not wearing her prosthesis in this photo! 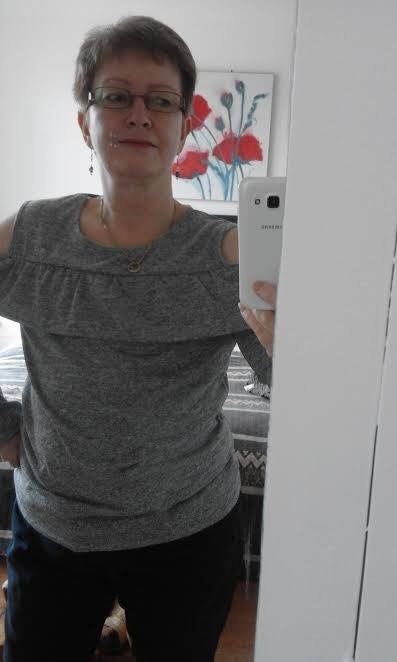 And here’s our other Clare again who got this pretty, embroidered, Bardot frill top from Matalan for £16. Oh I love all of these! 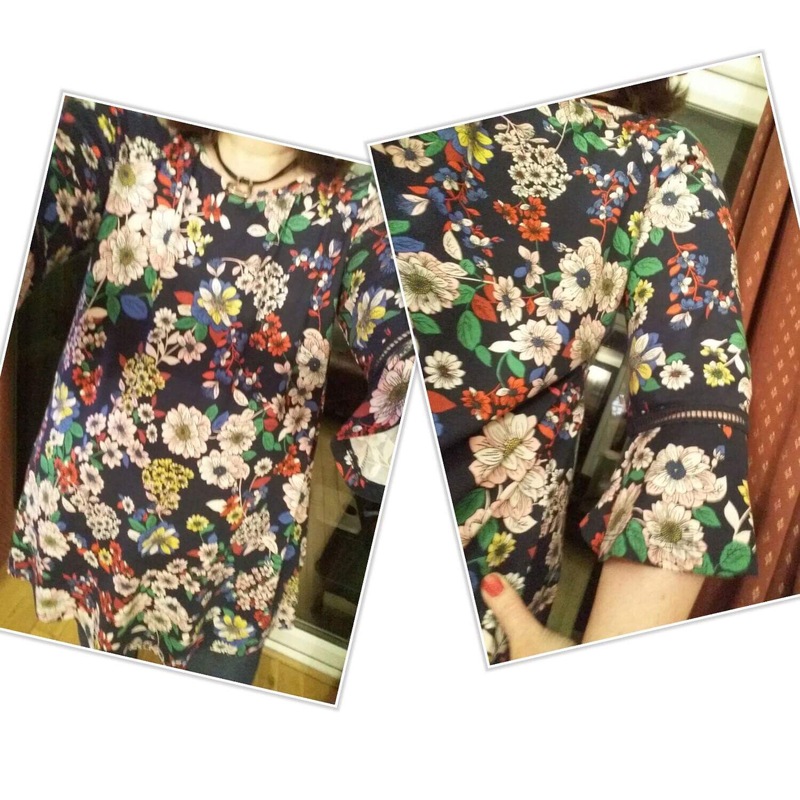 I particularly like the embroidered style that is on trend at the moment – I have a shirt from Boo Hoo in black with bright embroidered flower motifs. Also that Bardot style on is on my ‘I want’ list…Love that style!! Thank you for the inspiration! Fabulous selections yet again! You make me wish I could come to the UK to shop, but I enjoy the ideas you share. Thanks so much for the inspiration. 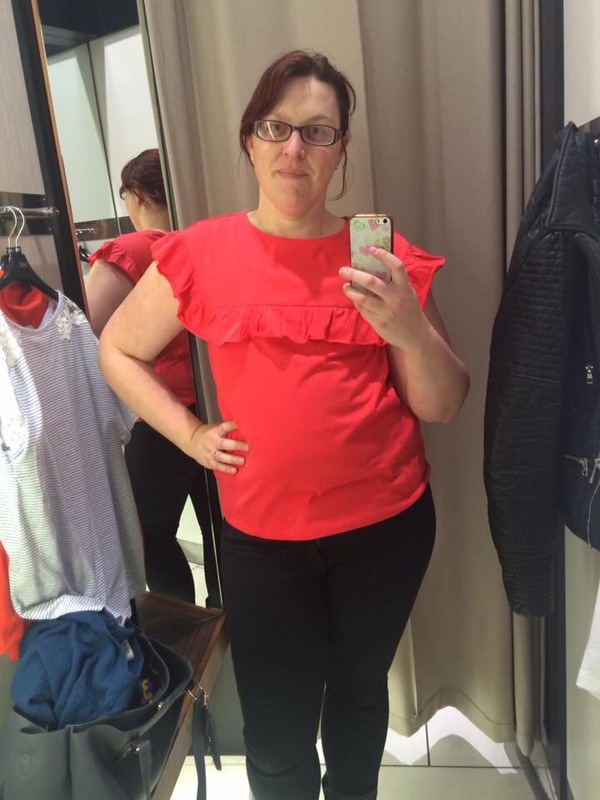 I am THRILLED to have found flatterfashion! Thank you!!! 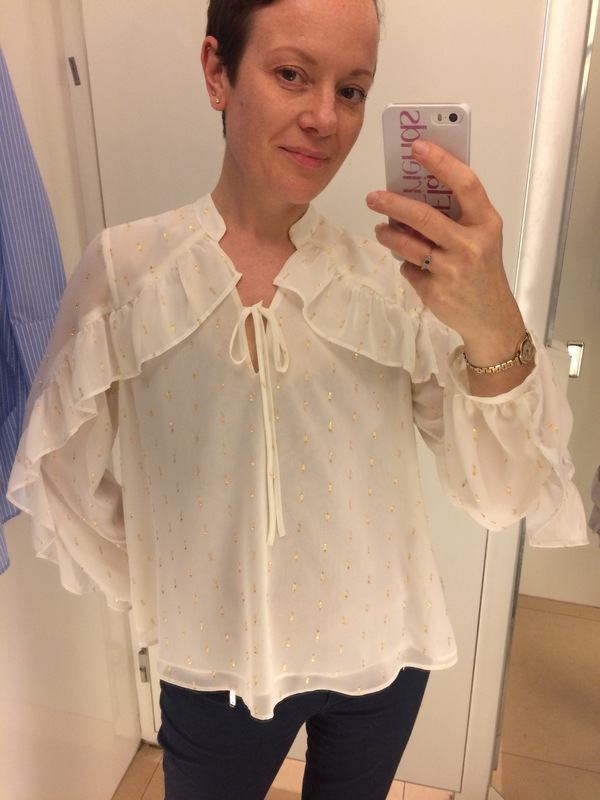 I’m 39 and didn’t have reconstruction (1 1/2 years ago) and have been shocked at the lack of fashion help for woman like US! I love how you style, you look absolutely fantastic. Love the items from River Island! I’m 18 months post-op for prophylactic bilateral any at this point live in androgynous t-shirts and jeans. It fits my minimalist aesthetic, sort of. 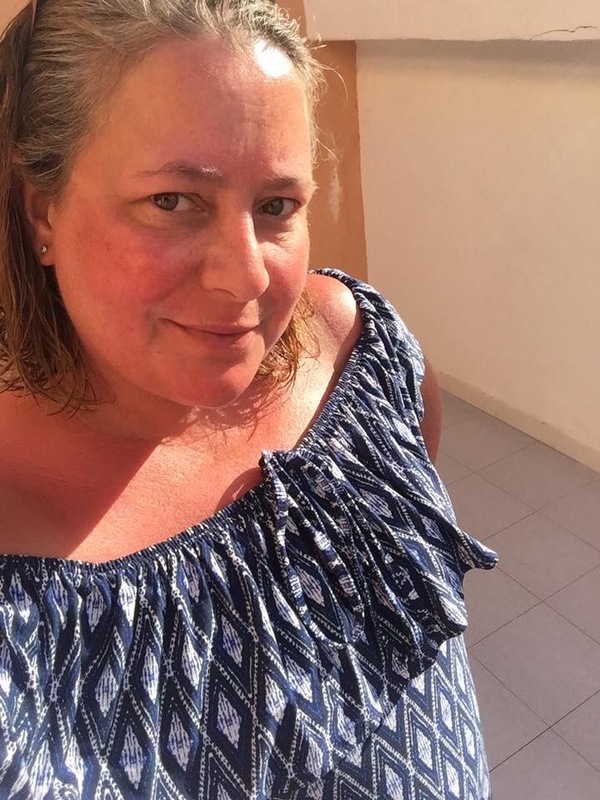 I’m looking for linen items for the summer to pair with jeans or maxi skirts–but I’m a US size 16 (but only sort of, as my bust and waist circumference are identical and my hips a full 12″ larger) so I struggle with looking frumpy on most things I try. Any recommendations for full bodies? Where are you located? Do you have a catalog?